Last week, we brought you news of retail changes in the trendy shopping districts of Westboro/Wellington West. This week, we turn our eyes to the ByWard Market. On the tony strip of Sussex Drive, any murmurings of change generally involve speculation of how the National Capital Commission, being the landlord for many of these storefronts, might have played a role. Us, we aren’t even going to speculate! Sometimes we ask interview subjects about the reasons for closing or the ins and out of their lease agreements. But no one wants to talk about the NCC. Any anyway, there’s enough to talk about this spring, and many new spaces to explore. 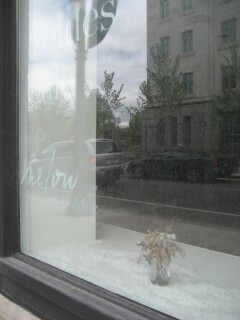 Mellow par Melissa Bolduc closed earlier this year. Photo by Sarah Fischer. We spoke with the Montreal-based designer behind this unique line last summer. Since then, they have closed shop. (Insert speculative gossip.) Apparently, they are looking for another location in Ottawa because they were having such success. We loved what they did with the Sussex space — let’s hope they bring their minimalist-industrial style to another storefront soon.